A complete anthology of all our wines and vintages from 2000 to present, including comprehensive blending/production and tasting notes, as well as weather data. LOVE THE LAND, KNOW THE GRAPE AND MAKE A WINE THAT HONORS BOTH. While those would be mere words to some, the Palmaz family — along with its cellar and winery teams – treats them as an ethos. From day one, our mission has centered on combining the age-old traditions of fine winemaking and viticulture with the most up-to-date research and technology, seamlessly fusing innovation and institutional knowledge. This unique approach, along with our gravity-flow winery (referred to as “the Cave”), enables us to craft distinct wines worthy of a place of honor in your cellar. 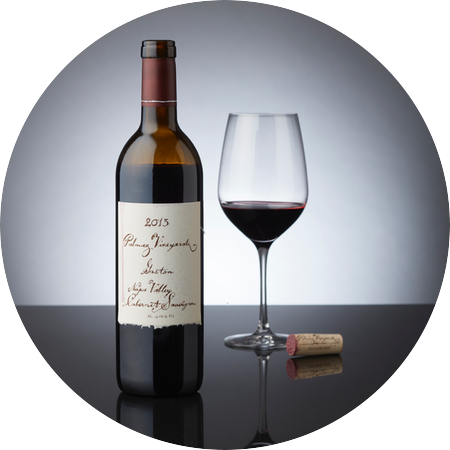 is the estate’s focus, notable for its depth and complexity, with well-balanced tannins. These wines are enjoyable in their youth, but also age extremely well. 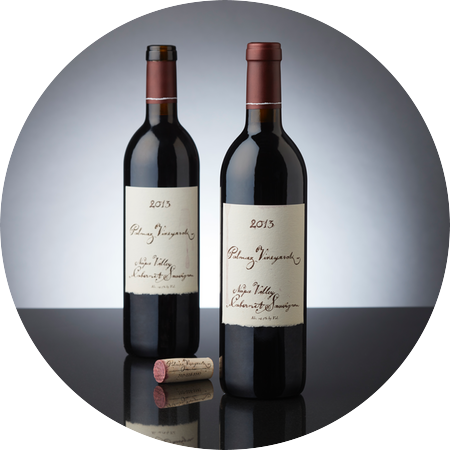 Depending on the varietal blend, this wine features rich layers of dark fruit, spicy oak, chocolate and ripe berries, and rises to a full-bodied finish. named for Amalia and Julio’s son, Christian Gastón, comes from the best lots of Cabernet on the vineyard, and is made and released only when the family feels that the wine will live up to its special designation. Generally this wine features a focused intensity along with a rich texture, with notes of cocoa and blackberries cradled in lush oak-driven aromas. Whatever the year, one constant remains: This wine represents the estate’s best. 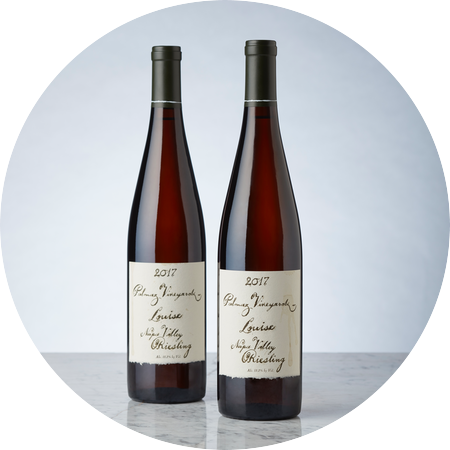 “is a blend made for the fire and the food,” describes consulting winemaker Mia Klein. Youthful, bright and juicy, with a rich concentration of tannins, this limited-production wine features Cabernet from our topmost elevation, and some Malbec in homage to the great wines of Argentina. 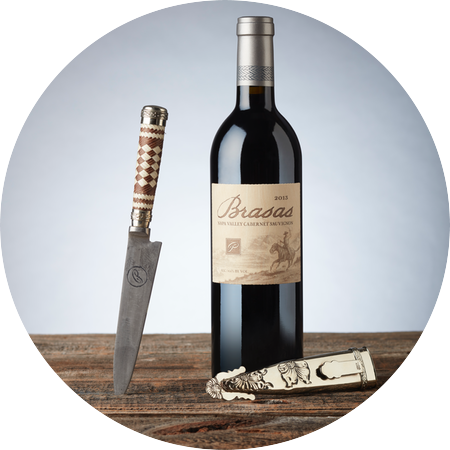 Wines of this style are sought after by the gauchos (the riders of the Argentine grasslands) to strike a harmony with grilled steaks and Asados (Argentine barbecues). and mothers are always celebrated together at Palmaz Vineyards. Amalia Palmaz was the inspiration and instigator of our Chardonnay. Although Julio always wanted a singular focus on exceptional Cabernet, Amalia convinced him that not every meal needs to be paired with such powerful wine; once in a while, she said, “a little white can be delightful.” He acquiesced, dedicating one tunnel in the Cave to Chardonnay fermentation. balances nicely between sweet, fruity and dry, thanks in large part to its low alcohol, high acidity and unique fermentation process. 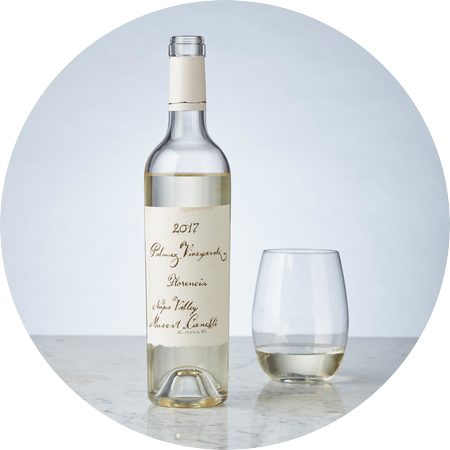 It is a welcome opener for dinner parties, perfect for hors d’oeuvres on the patio or as a first course in a formal dinner. Fermented almost dry with no barrel aging, the result is a crisp and refreshing limited-production wine. The later varietals in this series were named Louise in honor of Christian Gaston’s wife, Jessica Louise. is meant to provide dinner with a refreshing finale. The grape is one of the oldest known cultivated varietals (going back to the Persian, Egyptian and Greek empires), and planted in Napa for more than a century. The cold-fermentation process preserves the grapes’ delicate floral and spicy fruit aromas, while the residual sugar accentuates other taste notes. This limited-production wine was named for Julio and Amalia’s daughter, Florencia, and is available for sale only at the winery. is the portfolio's most recent addition. 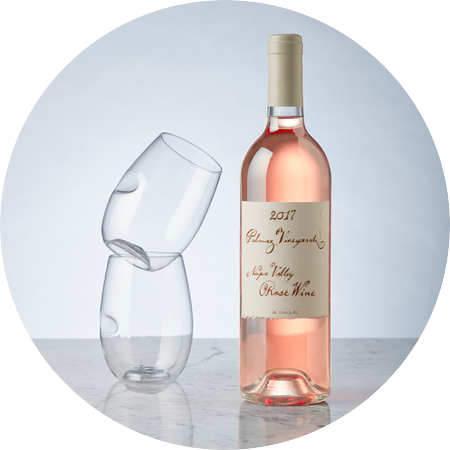 In 2012, Doug Mitchell (Palmaz's assistant winemaker, and our winemakers's son) crafted a test batch of Rosé that the family fell in love with. Ever since, we produce a small amount each year to share with friends. 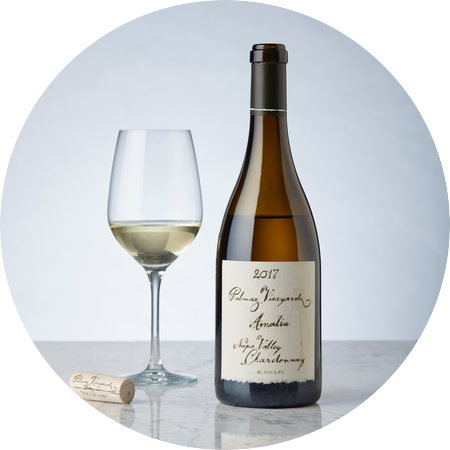 Equal parts refreshing and rich, this "cellar toy" is a delight when served on the patio at the height of summer. The Palmaz Estate hillsides, nestled in the Sierra de Napa foothills against the backdrop of Mount George, feature some 350 French Provençal, Spanish Catalan and Italian Tuscan varietal olive trees (Arbequine, Manzanilla, Mission and Picholine). 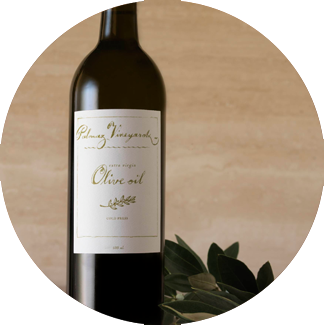 The olives are handpicked, stone-wheel cold-pressed and blended into an artisanal olive oil that offers a range of rich aromatics and medium spice flavors. Why let the adults have all the fun? 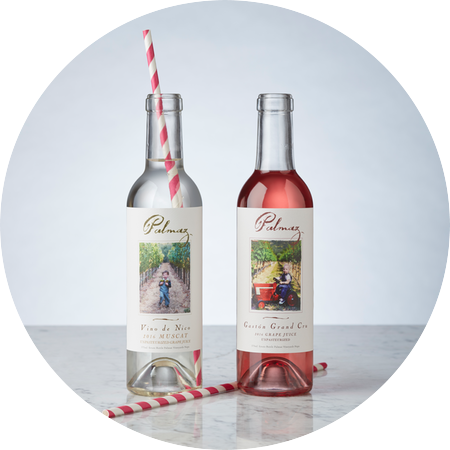 At Palmaz we produce a small quantity of unfermented grape juice for children to enjoy at the table. Using the same gentle whole cluster pressing technique found on our white wines, the juice is captured and immediately cold soaked. Grapes to bottle, this is a very special juice.